Door hitting the frame when closing - Just adjusting the jinges is not going to be enough if you want to eradicate the problem. A.L.S. will fix your door so that you don't have to call someone out every few months to rectify it. Door realignment - hitting the bottom could be a toe and heel scenario or the fact that the door has been incorrectly fitted. Not all PVC hinges are adjustable. Some have a 3 degree possible movement some are fixed and flag hinges are fully adjustable. Don't make the mistake of getting a so called expert to adjust the hinges then making your door worse than it was. Lock wont lock but works in the open position - thats comes down to realignment. The lock should work easily and when the handle is lifted or the key turns in a key wind fercility the door should compress easily into the frame. If you have to yank the handle up or operate it in more than one continuous movement then its not set up right. Key wont come out - faulty and or cheap cylinder. Like cars not all locks are the same. 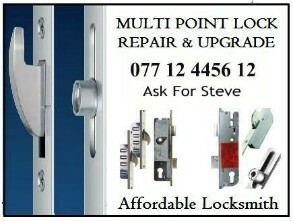 Fitting a good quality lock can mean the difference between your door working or not. Door wont open - the mecanism might fail, stop working or be jammed shut - A.L.S. can open the door without damaging it then get it working better than it did before. The key here is to bin the "that will do" attitude. Hinges snapped - All hinges are not the same - by fitting the right hinge to the door you can get the door working as it should again. Handles floppy - may not be the handles. By fitting a good set of sprung handles you may be just covering up the real problem and just sugar coating your door. This could lead to paying twice for a repair that didn't realy need.